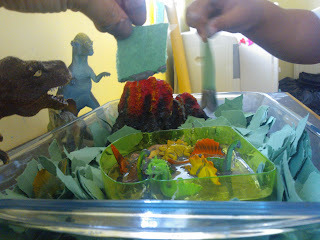 Today's idea was adapted from Fun At Home With Kids Dinosaurs and Sticky Mud Small World. To be honest it was one of those "the after noon is dragging its gonna be a long one need a distraction" ideas. 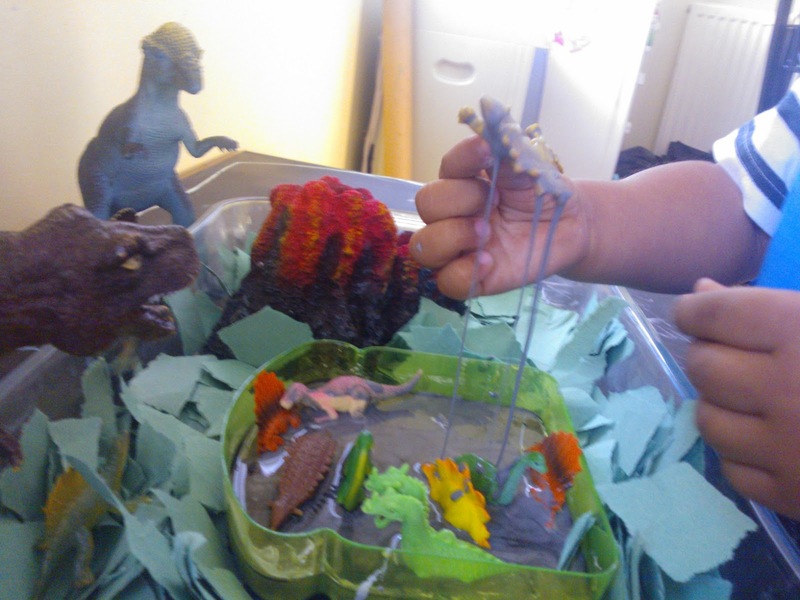 I hadn't really planned on adding it to the blog as not very original but it turned out so different to the mud one that I just had to add its a great example of how you can chop and change messy play ideas to adapt to your lil dudes and dudettes. How easy would it be to change this to pink and have a fairy glitter pool or blue as a mermaids ocean (I so need a girl next lol). Oobleck is so full of potential and yet I have only ever used white and as plain gloop. I just had to add it to the page it was amazing messy sludgey gooey sticky I am already planning the volcano one as was such a hit! 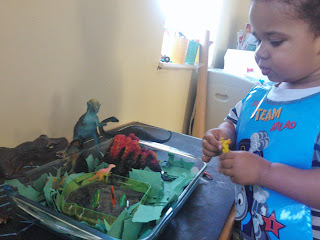 One of lil dudes fav books at the moment is Jack's Mega Machines The Dinosaur Digger. 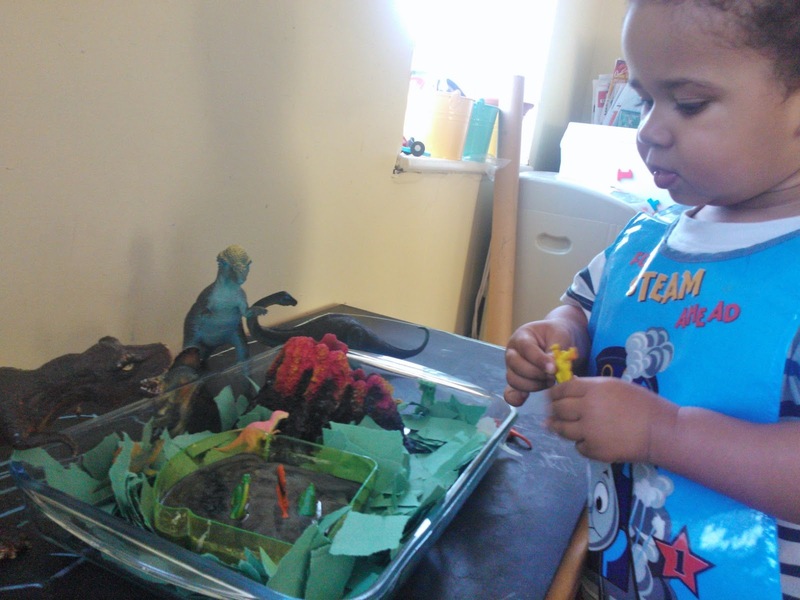 In the book a bunch of baby Dino's have to be saved from a tar pit when a T-Rex is heading their way. 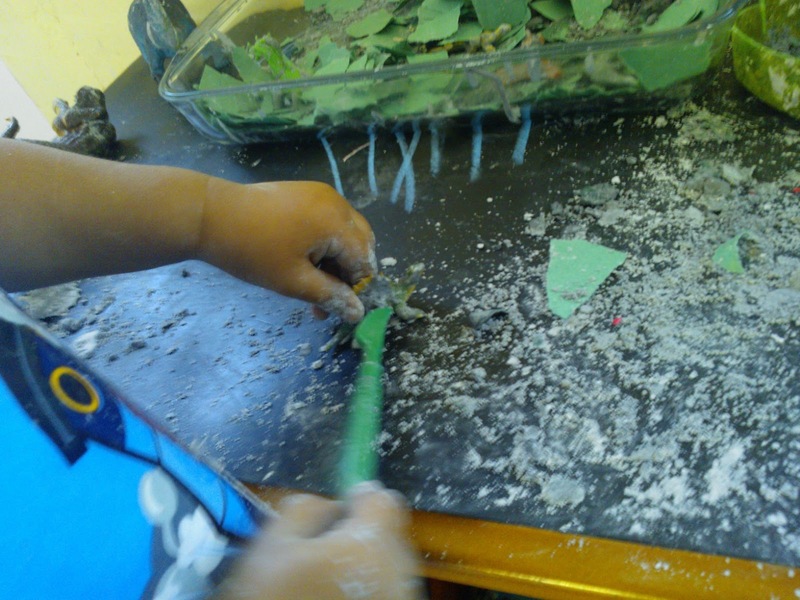 The Mud just had to be replaced with tar to recreate the book. 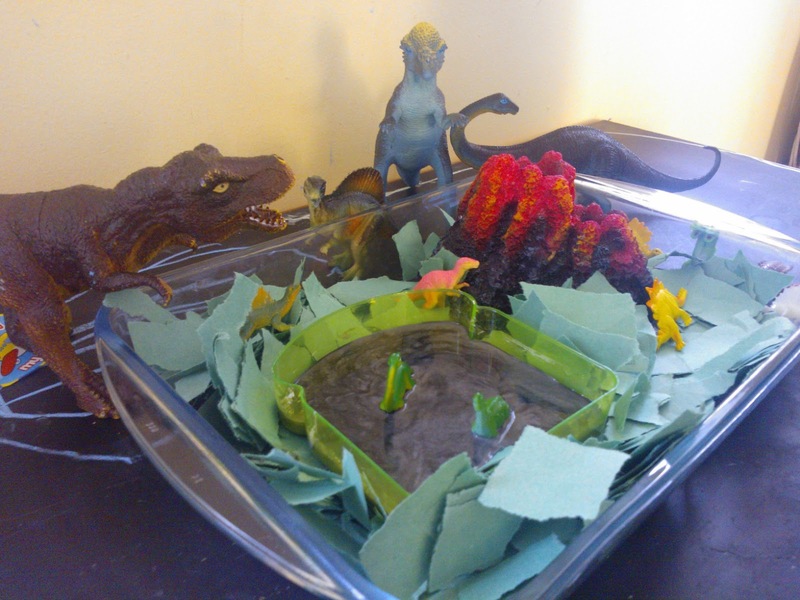 We ripped up green paper to make grass, Dug out the fish tank ornament volcano which now resides in our Dino land. (don't think the resident spider was impressed at relocating but hwy ho needs must)! 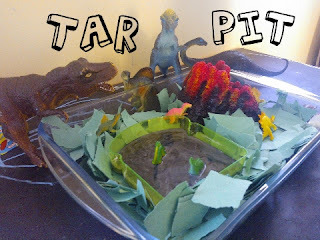 I used a sandwich box for the tar pit i wanted it to be shallow enough to almost blend in. The tar is obleck and black food colouring easy as that. 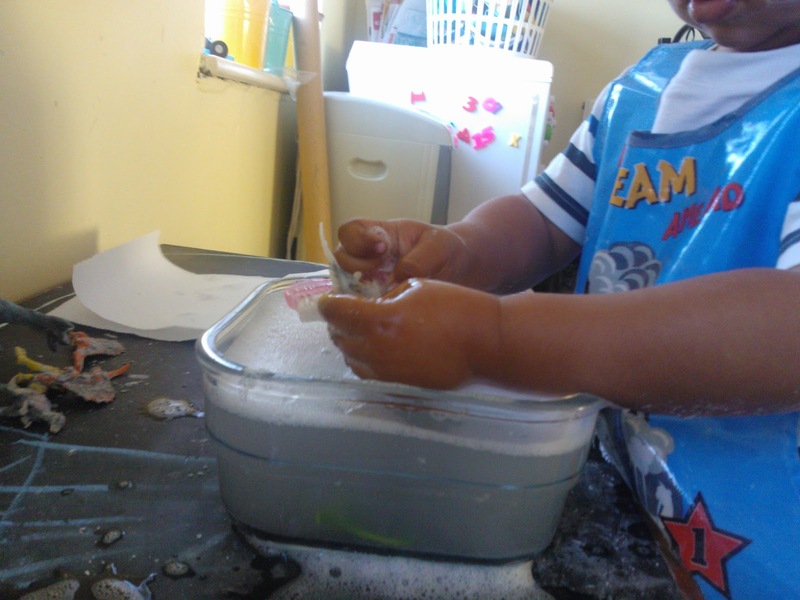 Basically you add water to cornflour till it looks like tar. 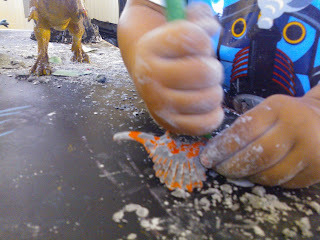 This lasted ages as you can see from the pics I had almost as much fun as he did the tar was irresistible! All the baby dino's got trapped in the tar oh nooo! Of course the paper had to get dunked! 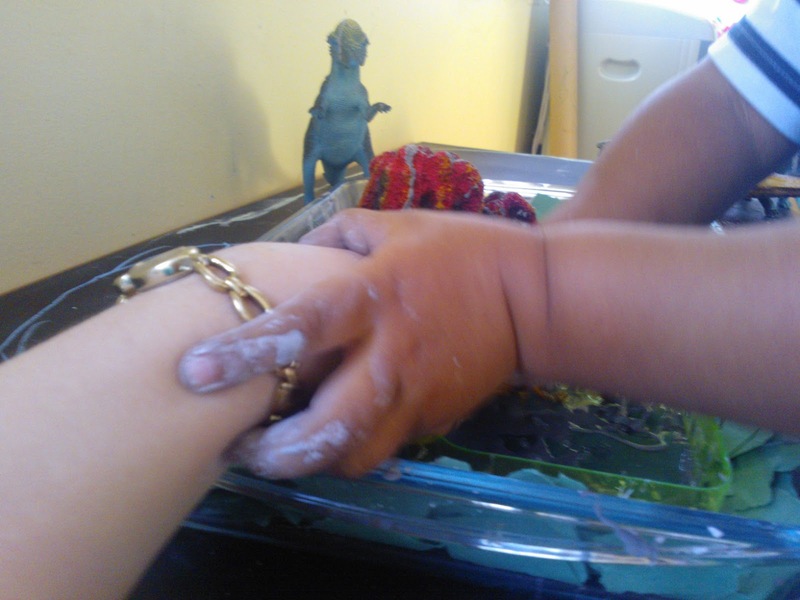 "Mummy put your hand in!" This was the stage I got "very" messy lol! 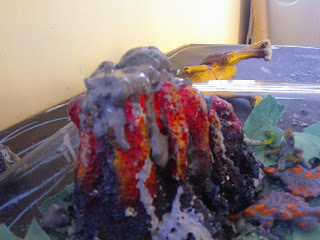 Then the volcano erupted... this was cool as we pressed it together and as it started to drip it looked like runny lava. The picture was hard to get but the reality was soooo cool! Once it dried a bit we had to excavate the baby Dino's. 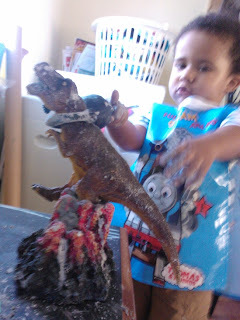 T-Rex got stuck in the volcano and Apatasaurus had to pull him free this picture may be out of focus but it cracked me up so much I had to add it! Although the mess looks horrendous I gave lil dude a bowl of water to give the Dino's a bath and after he spread that about a fair bit I wiped table over with a wet cloth and wiped round the floor the Oobleck just wipes off it's so easy to clean up! 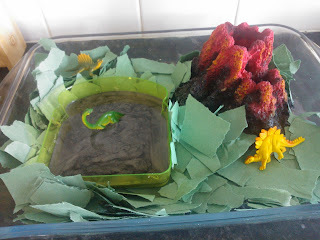 "I'm giving them a bath mummy!"